AC/DC-6-LC Universal Rapid Six Bank Charger. Charges six different batteries with or without radio attached. 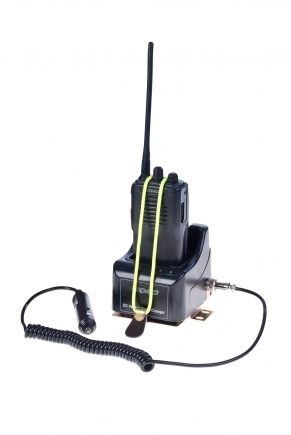 Space saving design with dual power source allows you to charge your radios anywhere. Perfect for disaster relief, public safety, rental fleets. AC/DC-3 Universal Rapid Three Bank Charger. Incredibly small and lightweight - half the size of the AC/DC-6 and utilizes our fully interchangeable adapter cup system. DC-1 Universal Rapid Single Vehicle Charger. Tri-chemistry vehicle (CD) charger. Ideal solution for charging your portable on the go. Perfect for forestry, public safety, film production and disaster relief. 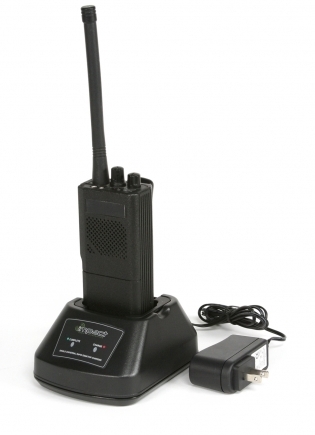 Includes charger cup, cigarette lighter power cable with mounting bracket and radio restraining straps. 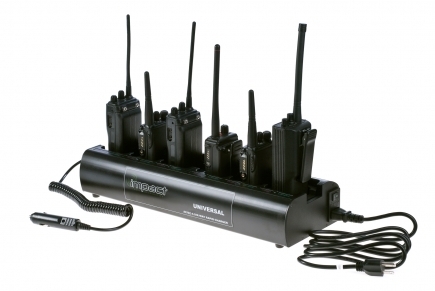 AC-1 Universal Rapid Single Desktop Charger. Rapid rate, tri-chemistry single desktop unit fitted with a self switching (110/220 V) wall cube power supply. It utilizes the same interchangeable cup system. Choose Adapter Cup for ordering - please add to the comment section. IMPACT Radio Accessories does not warrant the safety or effectiveness of charging Li-Polymer batteries in our chargers unless the battery make and model is specifically noted on this cup list.